Elegia - ZineWiki - the history and culture of zines, independent media and the small press. 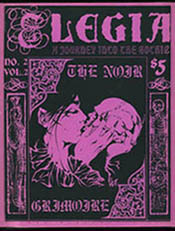 Elegia was a literary fanzine devoted to the Gothic by Marie Buckner. Subtitled, "A Journey Into The Gothic", seven issues of this small press release appeared in the 1990s, and ending in 1995. The editor stated that the zine was named after the New Order song, Elegia. It was published in Ventura, California. U.S.A., and contained Gothic tales, poetry, essays, art, and articles. Volume 1, #1 was published in 1991. Volume 1, #2 (1993) was a special Miroslaw Lipinski issue; Volume 1 #4 appeared in FallWinter 1992-1993; Volume 2, #2 was the Noir Grimoire issue; Volume 2, #3 featured the poetry of Scott Thomas. Artists appearing included Kim Traub, and Timothy Renner. Writing was by Mario Bava, Clint Catalyst, John Grey, R. Monk Habjan, Chad Hensley, Anke Kriske (Doppelganger), D.F. Lewis (Nemonymous), Miroslaw Lipinski, Mark McLaughlin (The Urbanite), John Navroth, Greg Norris, Wilum Pugmire (Punk Lust), Jacie Ragan, Octavio Ramos, Jr., James P. Roberts, Meg Smith (Red Eft), Jeffrery Stadt, Jeffrey Thomas, Scott Thomas, Don Webb, Leilah Wendell (Undinal Songs), Thomas Wiloch, and others. Leon Wild, reviewer for The Ninth Night, said, "This sumptuous magazine is much more than a neo-goth zine. It is a literary milestone for dark aesthetics." This page was last modified on 2 June 2016, at 07:55. This page has been accessed 7,571 times.